Anyone who knows me well, knows that my first hobby was skincare and cosmetics, long before I became interested in fashion. From crushing rose petals to make my own 'natural' scented moisturiser at the age of 10, to selling handmade soaps and lip balm for charity at school events. I loved the science and the experimentation involved, as well as being able to make things for myself! Although Hijab Style is of course mainly a fashion blog, some readers have expressed an interested in beauty-related posts, so I felt a few here and there wouldn't go amiss! 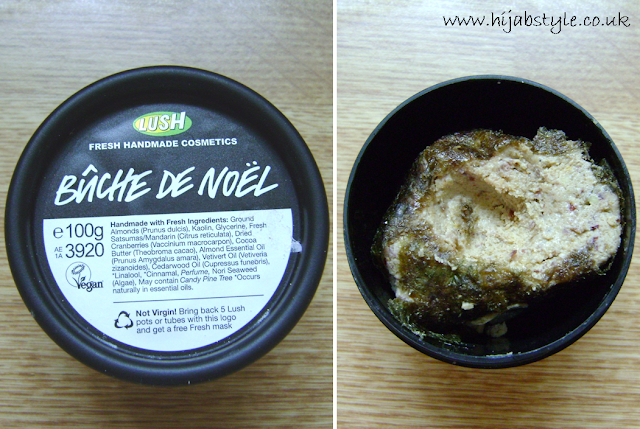 Lush are a cosmetics company who recently got in touch with me to review some of their new Winter range. Wondering what the link was; they explained that they developed alcohol-free versions of some of their limited edition products for sale in Middle Eastern stores, and are now introducing them to the UK market. I found it very interesting that a mainstream company are now specifically marketing products to the UK's Muslim population by actively reaching out to Muslim bloggers. The products I was sent are the Ponche shower gel, Golden Wonder bath ballistic, Ocean Salt scrub and Buche de Noel cleanser. They are all of course packaged in trademark Lush packaging; not particularly elegant but then again fits in well with the brand's premise of 'handmade' and 'fresh' cosmetics. 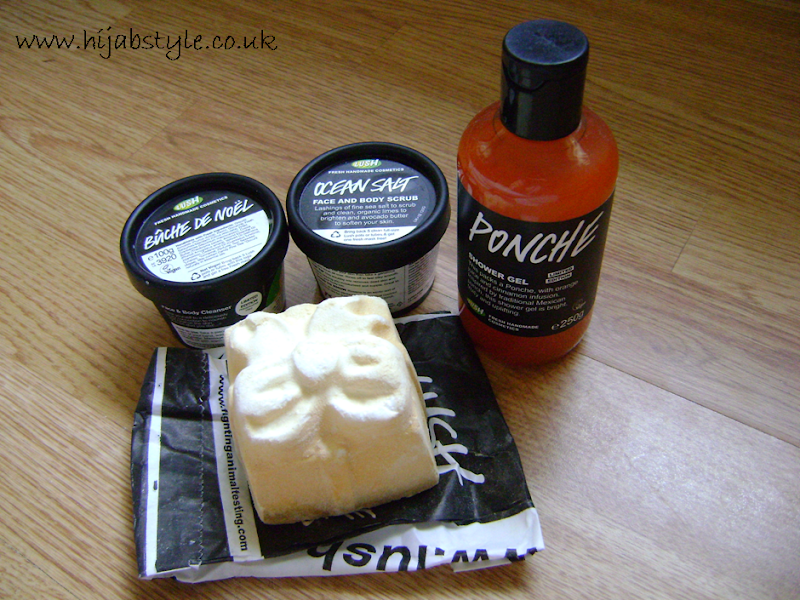 First off is the Ponche shower gel. Although I am usually not a fan of orange based products, I absolutely love the smell of this. It has a warm, fruity scent that is quite different from the artificial scent of most commercial shower gels. The consistency is a little runny, but it does produce a good lather thanks to the sodium laureth sulfate, which may not be suitable if you have particularly dry or sensitive skin. The Golden Wonder bath ballistic is huge, and it's more of fun product than a relaxing and pampering one! I was too curious to see what was inside, so I broke mine in two and was surprised to find a hollow blue inner layer with multicoloured fizzy pieces inside. It smells lovely and thankfully the glitter rinses away easily. 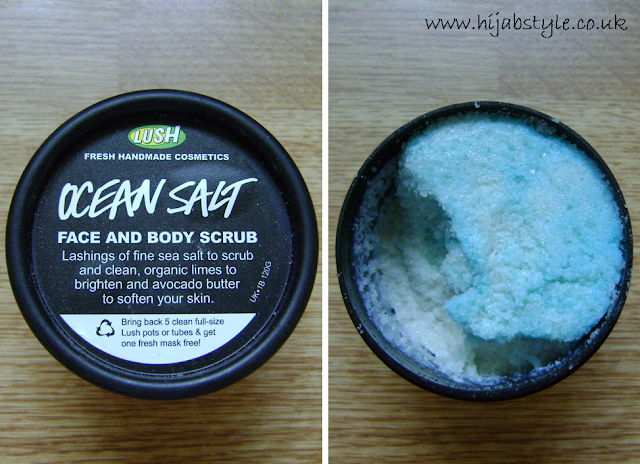 Ocean Salt is a scrub containing lime juice which gives it a really fresh, clean scent, and avocado butter and coconut oil to soften the skin. Although the scrub is marketed as a face and body scrub, I personally would not recommend it for use on the face at all. The grains are very abrasive and far too harsh for delicate skin, and aggravating for problem skin. Even just using it on my hand resulted in some redness. It does have a really nice, smooth consistency, and leaves the skin feeling soft so is quite effective for use on the body where skin is thicker. My favourite product is definitely the Buche de Noel cleanser (which is also preservative free). 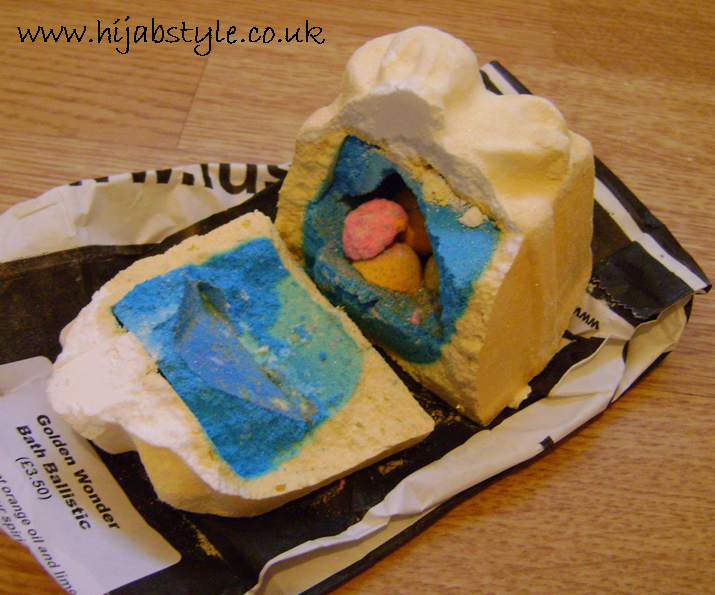 It is made of a base of ground almonds, kaolin and cocoa butter, and is wrapped in seaweed. To use this product, you need to take a small piece and mix with a litter water before rubbing into skin. Given those ingredients, I would also recommend that you leave this on your skin as a mask to derive the maximum benefit, rather than washing off straight away. 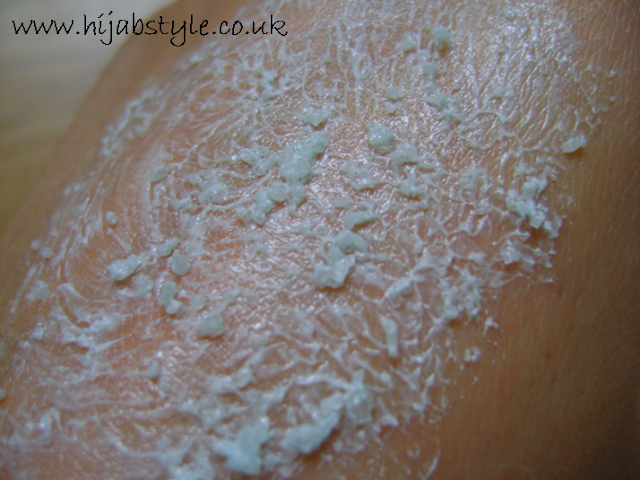 I personally stopped using foaming cleansers as they left my skin feeling tight and dry. The ingredients in this cleanser however are particularly gentle and nourishing and it would be great for dry or sensitive skin. As a bonus, it smells just like marzipan! Overall, my favourites are the Buche de Noel cleanser and Ponche shower gel. I also feel that although Lush do use a large amount of natural ingredients, the use of sodium laureth sulfate, parabens and artificial fragrance may not appeal to those looking for truly 'clean' products. I also haven't used the original versions of these products so don't know how they compare. The alcohol-free range is available online until January 2014. Salaam! I came across the "Muslim women making a fashion statement" article last night! I'm looking for a new cleanser at te moment. Which one do you use/recommend.